My GH Guitar strumbar died… What now? In case you’re wondering, my guitar has buttons instead of strings. You might have seen those before. Only used by L337 guitarists. So yes, my strummer gave out, but since the GHWT guitars came with touch sensitive strips, I could still play the guitar by tapping. It didn’t affect me as much as you might think, since I’m a well known tapper (I would tap even if the strummer worked), but unfortunately I seem to be in the minority; everyone else preferred to strum. 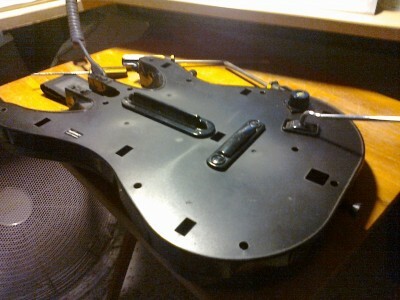 GH guitars are quite notorious for this problem; they’re not very long lasting. So what happens now? Well my band members were starting to get pretty unhappy, so I was all ready to go out and buy a new guitar when Arrch pointed out a fix here at 5frets.com! Excitement quickly turned to disappointment when I read through the guide; I had no idea how to do half the things in there! 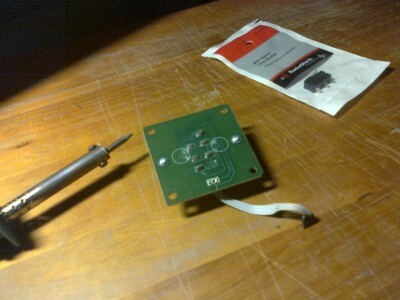 Like, what’s a soldering iron and how do I use it? Are you kidding me? I’m totally not cut out for this. Thank God for friends who are handy with tools. I managed to get some help from Tim, a props/armor-making friend who knew considerably more than I did. Considerably more is probably an understatement though. Since I what I know is somewhere around absolute zero. So we needed to get new switches to replace the old ones that had obviously disintegrated and died in my strumbar.. You won’t believe how hard it is to find these switches in Singapore. It’s really uncommon here, for some reason. 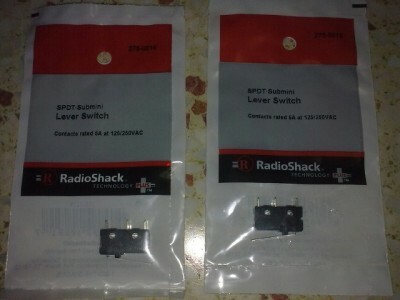 My suggestion is, just get it online from Radioshack. Oh and also, remember that you need TWO of these. One for the upstrum and one for the downstrum. Somehow that didn’t quite sink in, and I assumed we’d only need one. We were just lucky Tim’s friend in the States bought us two, since we certainly didn’t request for it! Easier said than done really. Difficult because the guitar was machine-screwed, making them insanely tight! Eventually got them out while trying our best to not strip the screws! Relatively easy. 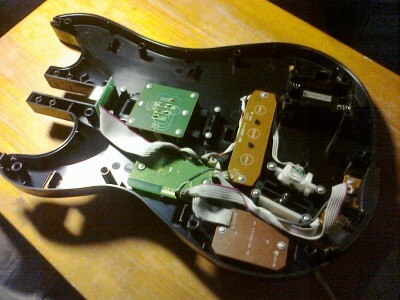 I was very amused to see what my guitar looked like on the inside! Again, screws were insanely tight but we got them out. Tricky! 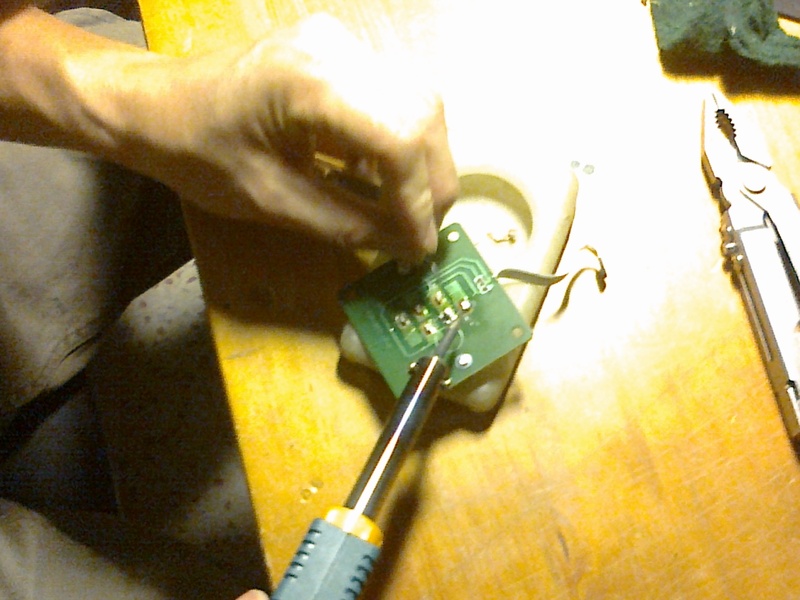 First time ever handling a soldering wick (I didn’t even get to touch the iron, but that was fine). Started out a bit messy, but I got the hang of it. Also it didn’t help that our iron died midway and we had to run out and get a new one. But the job still got done eventually. I also managed to tighten my loose whammy bar, tutorial here. And then it was time to test it out and see if it worked, or if our last two and a half hours were in vain… It did work, and its been working ever since! So if you’re ever in the same predicament as I was, fret not! Instead of buying a new guitar (which might give you another six months or so of playtime before it dies too), at least give this fix a go. What do you have to lose eh? advice used today though earlier 38mm diameter balls were used. Go back and spend as much time as you need watching the pros. know how to attack your opponent when he meets him. The most noticeable feature on all Kettler stands is the Riga Pro averaging at approximately 569 dollars. It could be the very best step you ever make.